As part of the Migrant Clinicians Network, my colleagues and I have treated many kinds of migrant over more than two decades: a farm worker who needs prenatal care who must travel every three weeks with the harvest; an asylum seeker struggling with insulin-dependent diabetes who is trying to escape war and violence; an immigrant who needs to travel back home in the midst of his tuberculosis treatment. But we are beginning to see a new type of patient — climate migrants — who I fear we will be seeing more of in the years to come, especially as the Trump administration seems to be ignoring the effects of climate change. 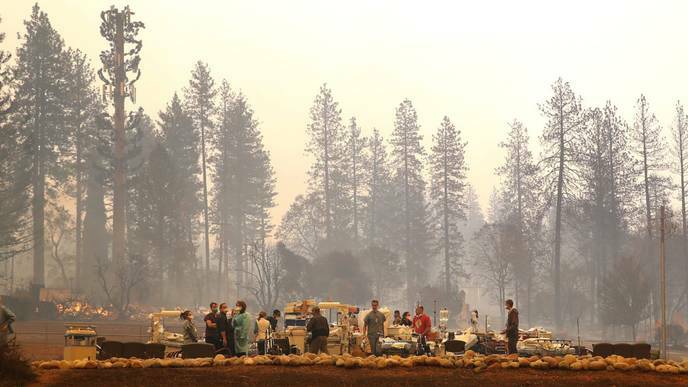 The Camp Fire devastated the town of Paradise, Calif. As it climbed over the hill toward the town of 26,000, many clinicians at the Feather River Hospital were instructed to prepare to evacuate. The fire moved with such speed that, just minutes after preparations began, the evacuation became mandatory. Horror stories of the rapid evacuation litter social media: a patient in a hospital gown in the back seat of a clinician’s car; a mother who had just given birth and was still immobilized by anesthesia trapped in an ambulance that had caught on fire; ambulances, trapped by fire on the roads, having to return to the hospital only to discover it had burned down; frantic goodbye calls to loved ones. Clinicians quickly began triage in the pop-up refugee camps in the nearby town of Chico. First, they treated people for respiratory problems and minor injuries in the Walmart parking lot. Then they fought outbreaks of norovirus in the churches and empty box store buildings that served as evacuation centers. And now, two months later, they are still caring for thousands of the newly homeless who have nowhere to go. The fires were the result of an amalgam of complicated factors, including private and public forest management, a complex urban-wildland interface, and drought combined with a topography, biosphere, and wind patterns primed for fire. But as with Hurricane Maria, Superstorm Sandy, and fires across the West, climate change pushed this disaster to a new, severe, and deadly extreme. In Central America, widespread gang violence, political instability, and devastating poverty leave families at the brink of starvation, while globalization, decades of previous migration, and modern technology make migration seem more plausible. But it’s the climate-induced droughts and disasters, longer and more intense than are typical, that are making migration a necessity. Climate migrants aren’t made only by natural disasters. They’re made from a complex fabric of social, political, environmental, and economic factors that is torn when a climate-strengthened disaster appears, be it stronger hurricanes, rising sea levels, devastating droughts, or increased heat. Climate change is pushing people to move for their immediate or long-term health and well-being. Health systems need to be flexible enough to serve climate migrants as they are forced from their homes. Most, for example, currently have trouble transferring medical records or scheduling appointments across state lines with ease. But those fleeing disaster will need quick and nimble systems to serve them. We must reformulate our health systems to accommodate climate migrants, whether they are arriving at the border because their crops failed or they have developed acute health issues arising from disaster. With no connections and few resources to help them connect to care, they must be able to find health services while in a new town. Services like the Migrant Clinicians Network’s Health Network can help. Through it, a clinician can sign up a patient, and a case manager will help that patient find services in his or her new location, assure the transfer of medical records, and even link the patient with needed auxiliary services like transportation to a health center. Such services save lives, but as climate change advances, we need to be prepared to implement them at a larger scale. Now, more than ever, clinicians whose core values include helping improve the health of entire communities must work and advocate to stop climate change so they can help people avoid becoming climate migrants in the first place.